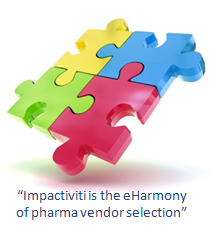 It took me 18 months to come up with the key analogy to explain my pharma consulting practice, but I’ve gotten more mileage out of that one statement than anything else I’ve used for marketing Impactiviti (my client-vendor “matchmaking” consultancy for pharmaceutical sales/training/marketing). Why is an analogy so important? Because we all need a shortcut into the understanding and memory of our attention-overloaded prospective customers. And the analogy – appealing to something already understood in order to bridge a gap to something new – is the most powerful mechanism imaginable to spark recognition and recall. You’re at a cocktail party, and someone asks what you do. “I’m a corporate content development specialist for a healthcare company.” STOP!!! See those eyes glaze over? Has comprehension occurred in that person’s mind? No – because you’ve not bridged the gap. And, perhaps, just as important – will that person be able to refer someone they meet the next day to you? Rewind. Your answer this time? “My company helps people with rare diseases. I’m like an internal reporter – I get to tell people how we do it!” Boom! 1. Your company is now a lot more interesting, and probably will provoke a follow-up question or three. 2. Your role is now clear – you’re a reporter (but on the inside). 3. YOU are more interesting, because your role has an aspirational and positive element, not merely a technical description. And the listener gets it, immediately. See how powerful a simple and vivid analogy is? And, the next day, when this person bumps into the CEO of another company that they know from the gym, who happens to be complaining about how ineffective their internal marketing is…guess who comes to mind? eBay caught on very quickly, in part, because it was just like one big virtual yard sale. People could “get” that. If you attach your company and offering to something pre-existing, common, and positive, you save yourself a ton of grief trying to force comprehension through a blizzard of terms and bullet points. This is the most challenging deliverable in a Clarity Therapy session. First, we map out your professional DNA by digging into your (personal or company) history, competencies, and aspirations. Then we settle on the core offering, the key message, and the compelling story. Finally, we cap it off with a memorable analogy, and you’re ready with a clear and unforgettable go-to-market approach. In a world swirling with information and noise, only the crystal clear will stand out. That should be you! Reblogged this on Citizenkim’s Weblog. analogies are one of the simplest and most powerful forms of stories. all good marketing is based on our instinctive love of stories, they’re our history – infact in french, the word for history and story are the same! Great wee read, thanks for sharing!